This trip focuses on 4 days of cycling and 2 days on a cruise. You will take part in a truly unforgettable journey- start from the narrow streets of the ancient trading town of Hoi An towards the ruined temple of the mysterious Cham holyland. 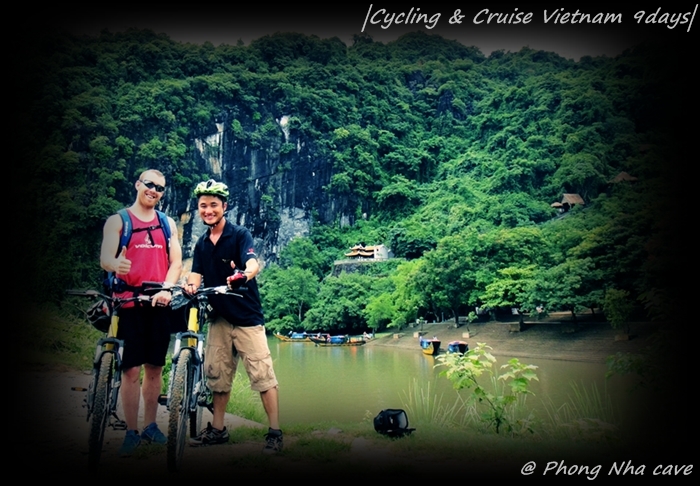 Then conquer the misty mountain pass of Hai Van and pedal through the Imperial city of Hue. Cross the 17th Parallel (DMZ) to explore the Cave Kingdom – Phong Nha Ke Bang National park before embarking on a cruise to admire the mystical islands of Ha Long bay. Completing approximately 250km of cycling also means crossing the ancient Champa kingdom – known to have existed from the 4th Century to the 14th Century, from My Son holyland to the Cave Kingdom of Phong Nha. Within a week of this trip you will see 5 UNESCO World Heritage sites in Vietnam as well as many other spectacular sites. The Dynamic beaches in Danang, the ancient trading town of Hoi An colorfully lit by lanterns at night, the mysterious My Son Holyland, the spectacular Hai Van mountain pass, the unique Imperial city of Hue, the DMZ of Vietnam, the hidden Cave Kingdom of Phong Nha, the exotic capital of Hanoi and the misty Ha Long bay. All in one journey. Upon arrival at Saigon International airport, you board a connecting flight to Danang – the gate to Central Vietnam. You are greeted by our team. Transfer to Hoi An for welcome dinner followed by team briefing and info. about the routes and rules of the game. Overnight in the ancient town of Hoi An. Cycling: NO – flying is enough for today! After taking a walking tour of the Old Quarter of Hoi An, you cross the Thu Bon river by local boat, then start cycling through rice fields, traditional villages making mattresses and rice paper to My Son holyland. Stroll amongst the jungle to explore the ruined Cham temples before enjoying an exclusive lunch at the site. My Son is listed as a UNESCO World Heritage site and is home to many mysterious brick temples dating from 4th -14th centuries. 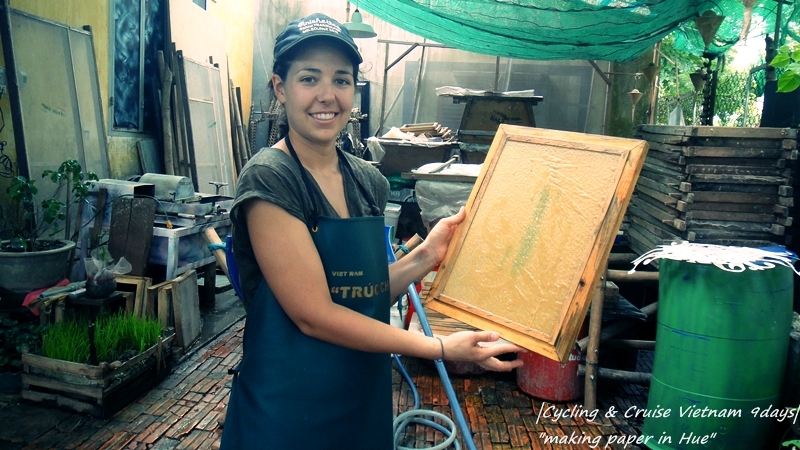 After lunch choose to pedal back to your hotel in Hoi An or take the van transfer to maximize your shopping and exploration time in this ancient trading town. Dinner under lanterns in the Old Quarter of Hoi An. 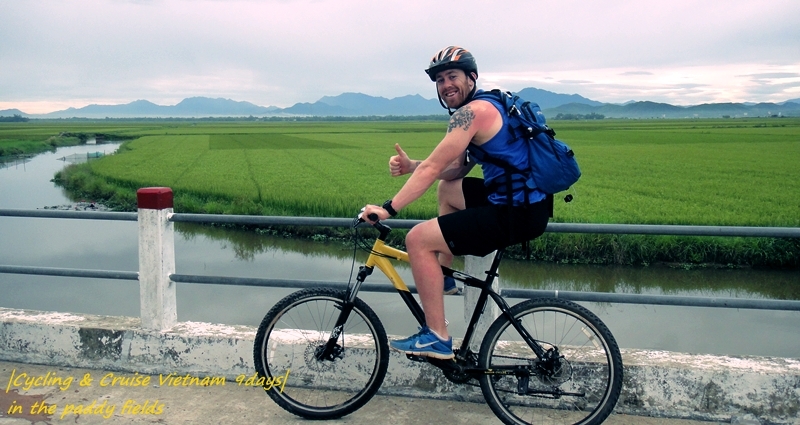 Check-out of the hotel in Hoi An and get the biggest day of cycling started! Warming up on the flat coastal roads along the My Khe beach of Danang before climbing 7miles and descending 7miles - the Hai Van mountain pass which Jeremy Clarkson of TOPGEAR praised as “a deserted ribbon of perfection — one of the best coastal roads in the world”. A well deserved ice-cream break on the summit of Hai Van awaiting you. Now enjoy the thrilling descent with spectacular views of Lang Co bay. Beach break and lunch. Transfer to Hue Imperial city to check-in to your hotel. Refueling with a one-hour traditional Vietnamese massage (complimentary). Dinner and overnight in Hue. After breakfast, we’ll depart to visit the vivid daily life of the local people at Dong Ba market. This market, not far from Hue Citadel, is the city’s biggest and you can see what people eat and buy on a daily basis. Keep riding to visit The Citadel – home to the Emperors of the Nguyen Dynasty (1802-1945). Leave the Citadel, pedalling along the Perfume river to An Hien Garden house – typical of Hue’s ancient architecture house. You are welcomed with fruits and tea from the host upon arrival. Then onto Thien Mu pagoda, one of the great symbols of the city, followed by incense stick & conical hat making villages; the tomb of Emperor Tu Duc and lunch at the garden house restaurant. Back to the hotel in the afternoon. Free time at leisure. Royal Dinner. Overnight at hotel. Van transfers you to the Cua Tung beach to start the final cycling challenge. Go along the coastal lines to reach Vinh Moc tunnel – also known as the legendary ‘Underground city’ during the American War in Vietnam. Local people stayed underground for nearly 2,000 days without sunlight in order to keep their homeland in one of Vietnam’s most serious battlegrounds. More uphills and downhills on the single road through pepper plantations and onto the 17th Parallel - Ben Hai river, the DMZ (demilitarized zone) of Vietnam from 1954-1972. Lunch break. Pedal along the country roads through the rubber plantations to get to the starting point of the Ho Chi Minh Trail which was first constructed in May 1959. Pay your respects by visiting the War Cemetery – home to over 10,000 soldiers who made sacrifices for their fatherland. Cycling stage has been completed! Welcome to Hanoi capital! After breakfast, you will be touring the 17th largest capital in the world- visit Ho Chi Minh’s Mausoleum and Residence, One-pillar Pagoda and ‘The Hanoi Hilton’ – Hoa Lo prison. A Water Puppet show in the evening will tell you about the Vietnamese countryside. Cycling distance: no more cycling! After breakfast, scenic three-hour drive from Hanoi to Ha Long Bay. Board and check-in with a welcome drink, then the cruise starts through Cho Da, Dinh Huong, Ga Choi and Hoa Cuong limestone islets while a lunch is served on board. Following this is a visit to Sung Sot Grotto, the ‘Cave of Surprises’, before taking a swim in Titov Beach or Soi Sim Beach’s pristine waters. The vessel then cruises further still to reach its overnight anchorage location near Ho Dong Tien or Luon Cave. Enjoy the sunset from the sundeck or while swimming, then dinner is served on board. The evening is devoted to relaxing in the peaceful setting, or to experience night fishing on the deck. Early wake-up for a breakfast amongst stunning scenery, then a small boat will take you to visit Luon Cave. Back on board, the cruise heads to Tuan Chau pier. Transfer by tender to Pelican & Image cafe. Lunch is served on board while the cruise goes back to Ha Long city to disembark at noon. Return to Hanoi. Overnight at the hotel. Notes: The cruise itinerary may change due to the weather and tide. Tips for guide, driver, boat crew & hotel porters. Other services not mentioned in the package above. We strive to consistently to amaze, surprise, and delight. For this reason, each itinerary may be subject to slight modifications. Contact us to speak with a destination specialist for the most up to date tours.